Excessive sun exposure leads to a melanocytes cells’ disequilibrium. Those cells are responsible for the appearance of brown spots on the directly exposed parts of our body and particularly on the face, the neckline and the upper side of the hands. 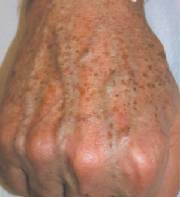 Those marks are called lentigo or less often could also be named “aging marks”. Those are often associated to an aging sign and are rather badly taken by patients as they are often perceived as inconcinnous from their point of view which is why they want to get rid of them. Flash lamp corresponds to a lamp with a wavelength ranging from 550 to 900 nm. The lamp’s power can be adjusted. Filters can be applied on the lamp to better target the treatment. An aqueous gel is applied on the zone to be treated. The hand piece is then applied on the skin and moved along the zone to be treated. Along the melanoma marks’ treatment, right after the session, scabs appear and will replace the treated marks. In order to avoid any scare risk, the scabs should not be teared off in any case, they should fall by themselves, naturally. Under the scabs, the skin might be rosy and remain this way for a short while. It is crucial to protect this skin area with a 50+ sunscreen to avoid a “repigmentation” on this zone.